The Milwaukee M18 Compact Brushless Combo Kit features a brushless motor, just not their premium PowerState Brushless. The kit packs performance and value that is perfectly slated to compete in the secondary level of professional cordless tools. The hammer drill and impact driver combo kit has become more popular in the past year or so, supplanting the drill/impact driver kit among professionals. Why? Simply because the hammer drill offers everything you get in a traditional drill/driver with the ability to drive fasteners in concrete and masonry applications. It’s no surprise that Milwaukee has put one together. What might be surprising is that the Milwaukee M18 Compact Brushless Combo Kit isn’t part of the M18 Fuel tools line up. Milwaukee M18 Compact Brushless Combo Kit: Where Does it Fit? Milwaukee certainly raised some eyebrows when they announced their new M18 Brushless Combo Kit but left it out of the M18 Fuel family. With recent releases, brushless has meant M18 Fuel, so what do we make of it? Better yet, where does it fit and is there a benefit? First of all, there isn’t a compact hammer drill or impact driver offering in the M18 Fuel family (though they have a compact Milwaukee M12 hammer drill). Milwaukee also isn’t advertising their PowerState brushless motor, so we can assume that it’s a step down from their premium brushless motor. In terms of power, the new Milwaukee M18 Compact Brushless Hammer Drill and Impact Driver are pushing very close to the what the M18 brushed motors are. This means that the realized benefits are going to be in run time and possibly lifespan if they are running cooler. This also begs the question if the M18 line may be making a transition to brushless motors for future tools. Looking at pricing may give an indication as well. As a bare tool, the Milwaukee M18 Fuel 18V Hammer Drill (2604) retails around $149. The regular Milwaukee M18 hammer drill (2607) is $119 while the new M18 brushless (2702) is just $10 more at $129. Similarly, the Milwaukee M18 Fuel Impact Driver (2653) retails for $129 whereas the regular Milwaukee M18 impact driver (2657) runs $99 and the new M18 brushless will set you back $109. All things considered, I’d be willing to spend a few more dollars for the brushless motor and stay on the RedLithium battery platform. As we’ve expanded our work space, we’ve also started to build out the interior storage of our 2000 square foot building. It started with a suspended shelving project and on this day, we were beginning to build our workbenches. We were using a combination carriage bolts and lag bolts to secure the frame, so we’d have a chance to put both tools to the test. The Milwaukee M18 Compact Brushless Hammer Drill had the job of drilling pilot holes for our lag bolts and pass throughs for our carriage bolts. We employed Bosch’s Daredevil Spade Bits for the carriage bolt task, but only needed to use the 3/8″ bit. Milwawukee’s Hammer Drill looked up at us as if to say, “That’s really all you’ve got?” Point taken. Just for kicks, I drilled some holes using the larger bits in the kit to see what would happen. Ideally, I prefer to use spade bits in high speed mode. With Bosch’s self-feed design, some drills are forced to go into high torque mode with the larger sizes. Not so here. The 2702 did just fine drilling holes confidently up to 1″ in diameter. I also had some new spade and Forstner bits to test along side them. After a few dozen efforts and a pressure treated 2×4 that resembled Swiss cheese, I’d have no hesitation taking this model to the jobsite. The Milwaukee M18 Compact Brushless Impact Driver had the task of sinking 1/4″ x 6″ lag bolts perpendicular to the carriage bolts. This single speed impact performed with just as much gusto as its counterpart. We had to be cautious near the end of each drive as the 1500 inch pounds of torque threatened to sink even the washer into our 2×4’s. Ergonomically, both tools in the Milwaukee M18 Compact Brushless Combo Kit were what we expected. The grip is excellent and balance is solid. The compact size was great for working in and around the frame of a workbench where we were forced into corners and angles. Although a full size impact driver might have been okay, the compact size of the hammer drill was greatly appreciated. I’ve got just one complaint and one request – I prefer to have a side handle on all of my hammer drills. 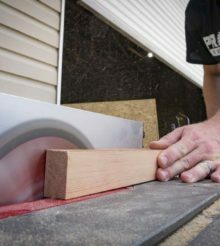 When it comes to wood boring tasks especially, spade bits and hole saws can bind and torque the mess out of your wrist. While a second hand on the tool can help control it, a side handle is greatly preferred. As for the request, I’d really like Milwaukee to include a second belt clip. More often than not, we’re using a drill/driver and impact driver in tandem and carry both on us. Next week, we’ll be visiting Milwaukee for their annual New Product Symposium where I’m sure we’ll get to ask some questions about the future of the M18 Brushless line. I’m hoping that we’re looking at a transition to a full 18V brushless lineup while still having the M18 Fuel line as the premium in power and run time. The performance and pricing of the Milwaukee M18 Compact Brushless Combo Kit are clearly set to compete with the most popular pro brands on the market while leaving room for the M18 Fuel models to still keep their place at the top tier. The bottom line here is that you get the run time and extended life benefits of a brushless motor combined with the outstanding RedLithium battery platform at a price that’s easier to swallow than the very top tier. I expect Milwaukee to capture some additional market share at the pro level, especially if they continue to bring more brushless motors into the M18 line. Pros that have been waiting to break into the Milwaukee M18 line can go ahead and take the leap. Those that require the best that Milwaukee has to offer will need to shell out an additional $75 for the M18 Fuel kit. The Milwaukee M18 Compact Brushless Combo Kit receives my recommendation for professional level use. I have this combo. and love it. If I need to get in tighter spaces I’ll use thr M12. My foreman has these and they are good drills and perform how you would want them to but I prefer my dewalts.